The addition of parsley keeps the red-skinned potatoes vibrant. Garlic Relish with Scapes - 3 tbsp. 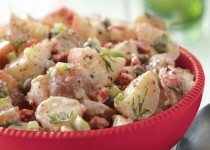 Dice cooled potatoes (do not overcook) and toss with Garlic Relish with Scapes, parsley and egg. Mix mustard into mayonnaise and fold into potatoes. Season to taste. This salad is creamy enough to scoop into a lettuce cup and mild enough for children to enjoy.